1927 Ansco Memo was a 50 exposure half-frame (18 X 23) 35mm camera made in Binghamton, N.Y. It was a less expensive alternative to the Leica (introduced in 1925). 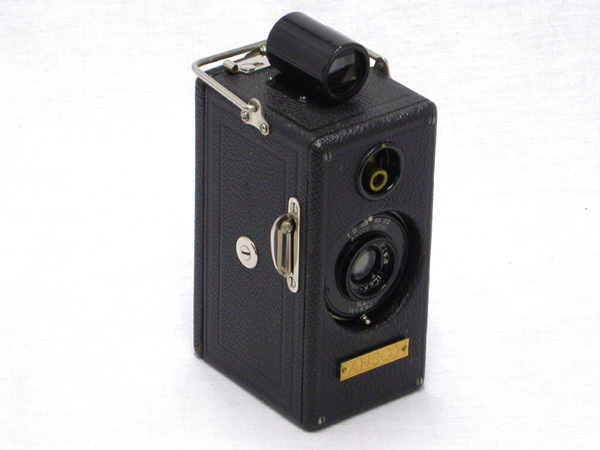 The Wooden vertical box camera has a leather covering, however, first models were all wood with brass fittings. The original proprietary film cassettes were also made of wood (later: metal). This version has a fixed focus f6.3 40mm Ilex Cinematic lens but a Wollensak Cine-Velostigmat lens was also offered (see last picture) as well as focusing versions. Film advance is by a sliding button on the back of the camera and exposure counting is automatic. A Boy Scout version was also available and is quite collectible. This kit comes with the original box, suede pouch, Instruction booklet and an exposure 'cheat sheet'. Also notice the advertising card, with price.